Dragon Project Game Released In The U.S. 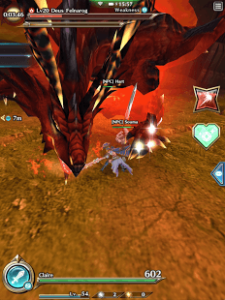 In Dragon Project, You Play As A Hunter, Control The Game With One Hand. You Are On A Mission: Team Up With Friends To Kill Monsters. Drag To Run In A Direction. When You Are Near A Monster Tap There And You Will Attack On It. Collect Precious Material To Forge Or Upgrade Weapons And Armer, Then Enhance With Magi To Get More Powerful Skills. You Can Do Them All With One Finger. In This Game, You Explore The Open Kingdom Of Heiland In Stunning 3D. On Your Way, You Will Meet Unique Characters And Discover Stories. Complete Missions And Hunt Monsters To Collect Precious Material. This Game Is Now Available For Download In Google Play Store. Change Log Shows – It’s Time For Global Launch. So, This Should Be Available For All.